Top: Sterling Section member Carroll Lawrence hand hews a floor joist for Beaver Meadow Lodge. Middle: Beaver Meadow under construction 1947. 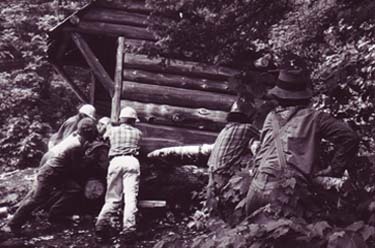 Bottom: Whiteface Shelter gets hoisted up to replace the rotted sill logs 1977. "History of the Sterling Section" by Smith Edwards. In 1997 the Green Mountain Club decided to have all membership dues be collected by "the main club" rather than have each Section collect its own dues directly. With the discussion of uniform dues came the debate about the system of having various sections, how they came about and for what purpose. I knew that there were a couple of big boxes of old Sterling Section documents. My biggest finds were Bob Haggermans unpublished history of the Sterling Section and meeting minutes, old work and outing reports and general correspondence. Most of which follows is taken (stolen) from Bob's material. The present day Sterling Section of the Green Mountain Club was formed in 1946 and reformed in 1971. Before that a couple attempts were made to form a Sterling Sections to the GMC. The first in 1911, was in Morrisville. The principal organizer appeared to be Frederick G. Fleetwood, who at one time served in the Vermont Legislature and also as Secretary of State. The purpose of the Section was to build trails on Elmore Mountain and establish a clubhouse there. A second prominent member of the section was Thomas C. Cheney, who had recently completed his second term as Speaker of The Vermont House of Representatives. Only two reports of the section appeared in the local papers and the Original Sterling Section Died in it's Infancy. Two years later a Mt. Sterling Section formed in Johnson. In 1915 another "official" GMC unit was formed at Johnson High School, called the Pathfinders. The Mt. Sterling Section did some trail work and built a log shelter with a bough roof. The Pathfinders was formed to provide a substitute to more expensive High School Athletic programs. They held at least one overnight event at Sterling Pond with a group from Stowe High School. Neither group lasted more than a few years. The real Sterling Section from the teens until after World War Two was Fred W. Mould. Fred was a lifetime GMC who operated a granite business in Morrisville for many years until his retirement in 1930. 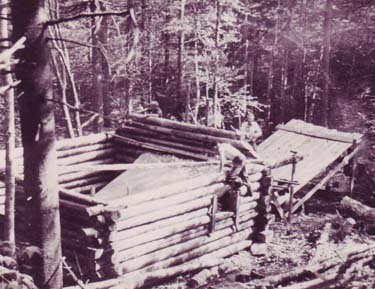 In 1913 Fred and others converted a logging camp in Beaver Meadow to one of the earliest GMC Camps. It was named Shattuck Lodge after the logger but later it became Mould's lodge on the U. S. topo map. Fred helped clear the original Long Trail between Smuggler's Notch and Johnson, and the trail was opened in time for the 1920 edition of the Long Trail Guide. During the 1920s and 1930s he led the effort to enlarge Shattuck Lodge and build the first Whiteface Shelter, and he helped the Long Trail Patrol paid trail crew in its construction of both French Camp and Barrows Camp. All during this time Fred, often alone, worked on the regular maintenance required to keep the Trail open. The Long Trail News, December 1926 reports, "tireless worker, Fred W. Mould of Morrisville, has built a new cabin of balsam logs at Sterling Pond." I am writing this by blatantly plagiarizing Robert L. Hagerman's unpublished The Sterling Section, Green Mountain Club. I 'll now quote directly from this history. "By early 1950 Mould was 80 years old but he was still as active hiker and woodsman as ever. His love of outdoor activity was reflected by his oft-repeated words to friends that 'I hope to die on the Long Trail.' And just that happened. On June 9 that year Mould and another GMC stalwart, Eugene L. Bamforth, were hiking to Beaver Meadow and apparently planned to continue to the top of Sterling Mt. Carrying a 40-pound pack, the diminutive octogenarian (he was five feet, two inches tall and weighed only 135 pounds) and his companion set out on a scorching hot day. Just short of the lodge Mould sat down to rest. Moments later he toppled over and was gone." "Before his death, however, Mould had seen the formation of a new Sterling Section. This was organized on January 27, 1946 in Morrisville with Henry Mould, one of Fred's sons, as its first President. Spark for the group's formation was a plan to build a replacement lodge for what by that time was the somewhat bedraggled Mould's Lodge." Every Sunday from early May until Fall the group worked on what would later become known as Beaver Meadow Lodge. After the "every weekend" summer of 1946 the Sterling Section settled into a period of monthly pleasure outings. The beavers returned to Beaver Meadow and the access trail had to be rebuilt. Interest in the section waned in the late 1950s, resurged in the 1960s, then waned again and by 1970 the section was inactive. In 1970 Edmour Germain, a professor at Johnson State College, and Robert Hagerman sparked a new revival of the section. On September 24, 1970 a meeting of some 35 interested persons was held which successfully re-established the section on a firm footing that continues to this day. Bob Hagerman served as Section President from 1970 until 1977 and as the Sterling Section member of the GMC Board of Directors from 1978 until his death on December 16, 1982. Bob, a bachelor, and tireless GMC volunteer served on many club committees. He was editor of the Long Trail News from 1974 until 1981 and is the father of many of today's Green Mountain Club publications. Bob worked in Montpelier for the Vermont Historical Dept. where his efforts helped preserve GMC history. He wrote a history of Morristown Vermont and his History of Mt. Mansfield is considered the Premier reference about Mt. Mansfield. I have written of two men, Fred and Bob, who have played major roles in the Sterling Section and particularly Beaver Meadow, the heart of the section. Of the hundreds of others who have contributed to the Sterling Section, I would like to name two more, Fred Judd and Tony Smith. 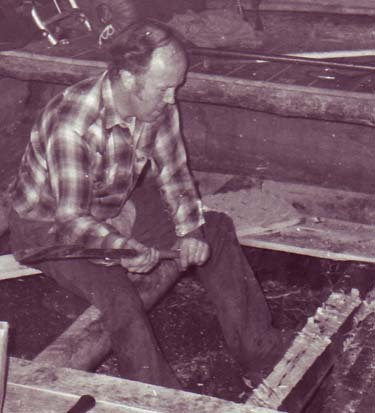 Fred during the 70's was an outstanding example of GMC trails and shelter maintainer. He worked hard on both Sterling and St. Albans (now Laraway) Sections of the Long Trail. My friend Tony has been an active member of the section since the 1970's serving in many capacities and quietly doing hours of trails and shelter work. However, I believe his greatest achievement was when he lead a petition drive for the State to buy the Beaver Meadow lands. I believe that if the State had not purchased the lands when they did development was probable. His petitions with hundreds of signatures of local taxpayers helped influence the States final decision to buy. There have been many people who have played important roles with the GMC in the past and many of these names are being lost. If you have a father, mother, other relative or anyone who fits this category, please write a biographical sketch of their involvement with the GMC. The section historians and History and Archives Committee need this type of material. 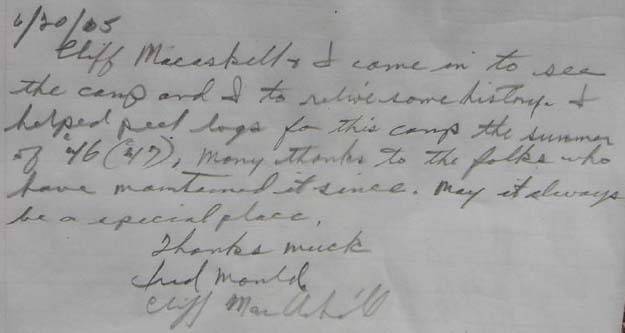 Fred Mould's son leaves a note in the Beaver Meadow Lodge logbook in 2005.